I installed Virtualbox and XP guest in Ubuntu 9.04,and enabled file sharing between them.But I encountered USB problem when I inserted a USB disk.Finally,I worked it out by following steps. 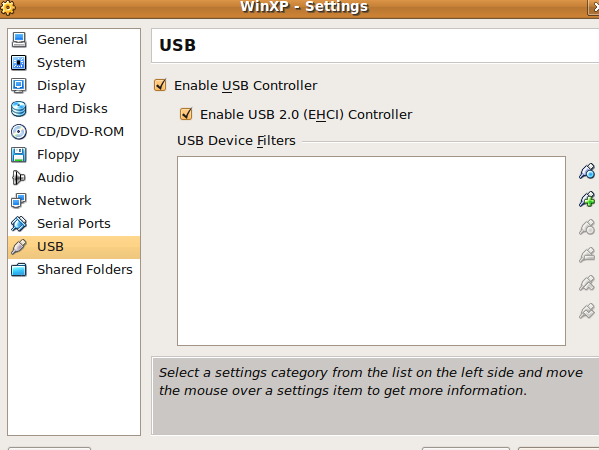 1.Open up VirtualBox,select the virtual machine and click on Settings.Then select USB in left and check the two checkboxes. Here,1001 is the group id. Add this line in the bottom. Here 1001 is the group id in step 3. 4 users responded in " Enable VirtualBox virtual machines(Guests) USB support "
Great work!!! I had tried pretty much every other solution I could find, but yours was the only one that worked!!! You ROCK!!! Thanks a million dude!!! none /proc/bus/usb usbfs .. cannot work because bij me ubuntu 10.10 there is no usb in the dir bus. Yea , I did like this ,just followed your steps , the last one was maybe to much, or maybe not. I do not know. I found an better way , but for the time now my OS is fucked up . I rebooted and did have surprise my system never booting up !!!! Yea I did reboot. Great mess after that.